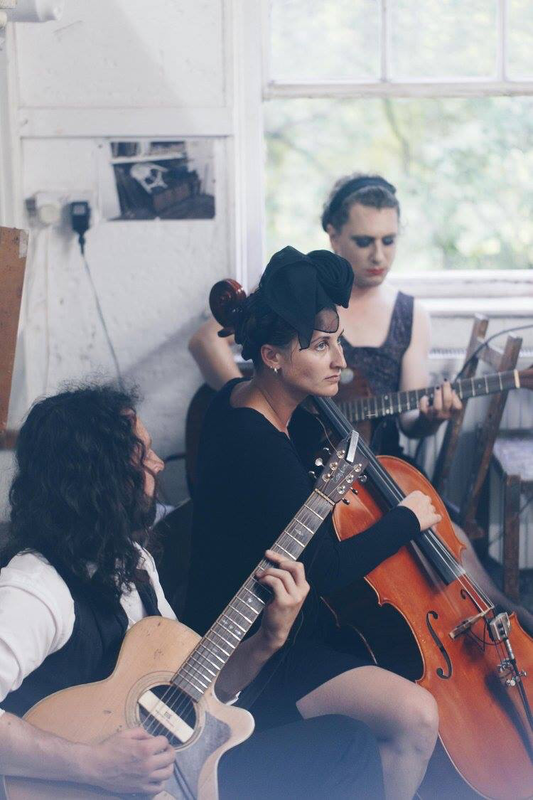 A cellist since the age of 6, a folk lover and a Brightonian at heart, my style fuses my classical training with my ever expanding interests in folk, world music, pop and experimental genres. The cello is a wonderfully versatile tool and should not be limited solely to the traditional. I aim to weave this philosophy into both my playing and my teaching. Catch me performing in eclectic world-folk outfit Beggars Belief and in alt-folk duo Bee and Jackrabbit alongside poetically cynical singer-songwriter Paul Murray (pictured left; top right). I am also a member of The Drawchestra (pictured left), providing a macabre musical twist to The Drawing Circus' large scale events. In addition to performing, I am also an experienced session artist, having worked with a number of clients in and out of the studio including multi-instrumentalist folksters Hickory Signals and award-winning composer Paul Englishby. I am available for session work, including recording, events, one-off gigs and tours. If you would like to book me or one of my bands to perform or record, please contact me to discuss further.